A week or so ago, I got my 3D swap from Jamie Adcock, a military wife demonstrator from Japan! Wait till you see the photos! 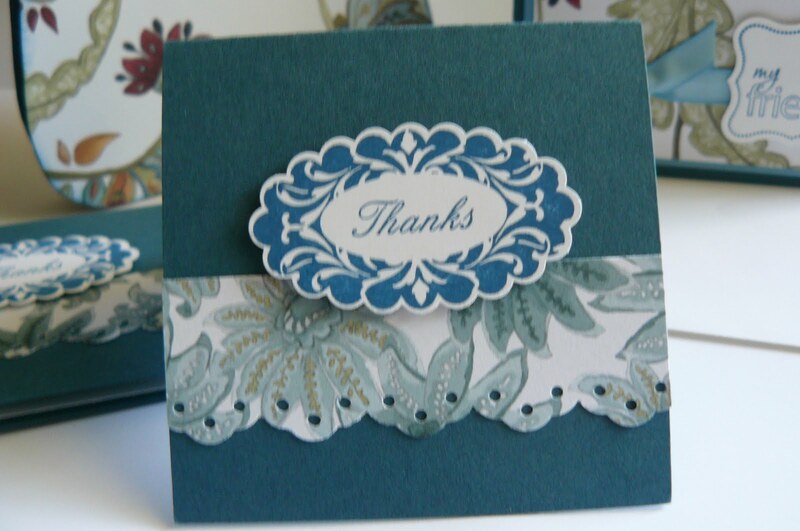 I got so many ooh's and aah's from all of my stampin' customers that made it to my Open House last week! You'll soon see why! Yep, that's the whole set! 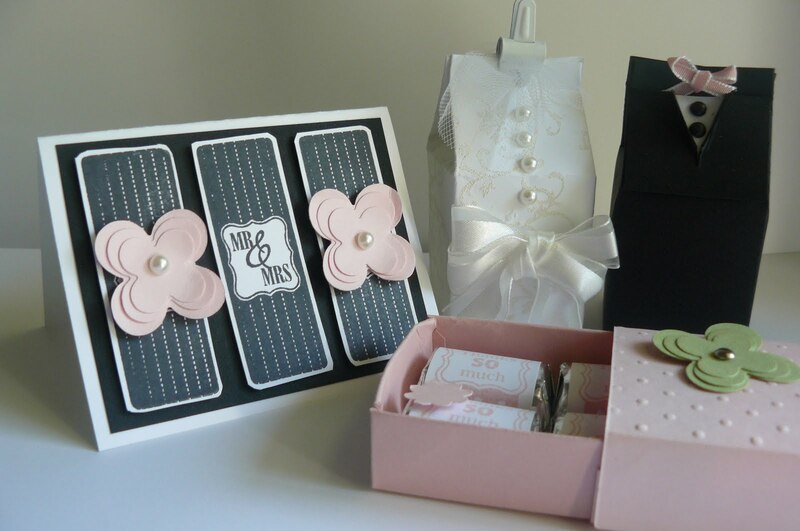 A matching card and envelope, 3 3x3 cards that were inside the little purse, and the purse itself! But wait ... there was more! She said that her kids helped her pick out some Japanese candy for me to sample! Yum! Here's a close-up photo of the handle that she braided with ribbon -- I'm guessing it was satin ribbon but it might have been our retired grosgrain too. 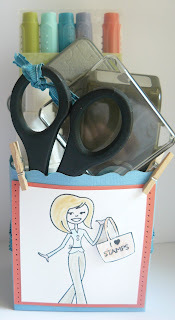 Here are the 3x3 cards tucked into the adorably adorable purse! Here's the standard-sized card -- I think you can see the gorgeous envelope in my top photo since I obviously missed it in this one! Don't you love the Paisley Petals DSP? I certainly do, and I sold a few packs after my customers viewed this swap! I think Jamie told me the template for the purse was available for purchase from Becky Roberts on her Inking Idaho blog if you're looking for it! Good morning all! I sure do hope everyone's been able to stay cool! Right now I'm halfway through my whirlwind visit to upstate NY. My family and I visited my husband's family in Jamestown NY for a few days at the beginning of the week. On our way out of town, we stopped at Niagara Falls! It truly was lovely but I think we chose the hottest day of the year to visit! I'll have photos later, but unfortunately I forgot my camera/computer cable. We were ready to leave but Christopher really wanted to visit the Cave of the Winds first -- thank goodness he talked us into that! It was the best part of the whole visit! When you pay for your tickets, the cost includes a disposable raincoat and sandals. You take an elevator down 175 feet, and then you walk out on this deck and stairs at the base of the falls -- wow! Did I say "WOW?"!! We were totally soaked but so totally refreshed by the end of that trip! How amazing is our world? No "man" could ever create something so awesome!! Well ... we're now visiting my parents for a few days -- this afternoon, we plan to drive to Cooperstown, home of the Baseball Hall of Fame. I don't know that we're doing the museum this trip, but Lake Onandaga and the town of Cooperstown is just lovely too. My parents live about 10 miles outside of Cooperstown. Did I tell you that my first nursing job was in Cooperstown and that the Hall of Fame day is a paid hospital holiday?! I offered to work that day (25 years ago now! ), but realized that the only reason it was a paid holiday was because that was the only way they'd find people crazy enough to come into town that day if they weren't going for the baseball!!! 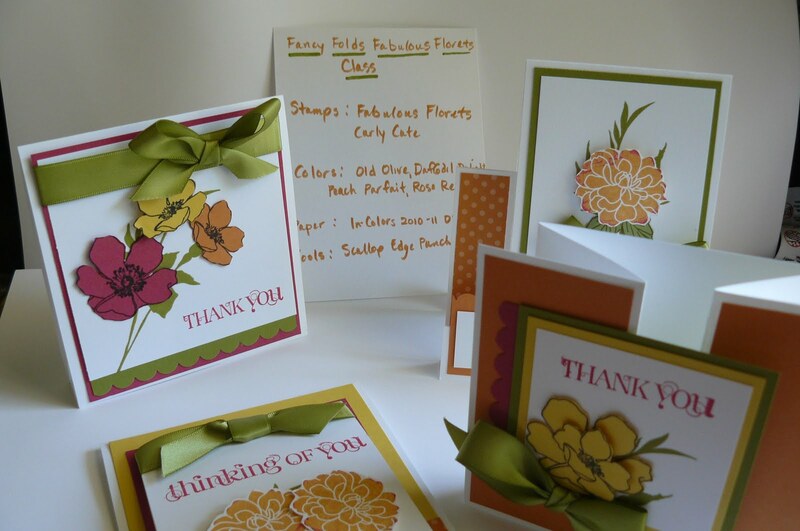 I just wanted to make sure everyone is planning to attend my newest class, the Fancy Folds Fabulous Florets stamp class! Say that 5 times fast! What a tongue-twister! 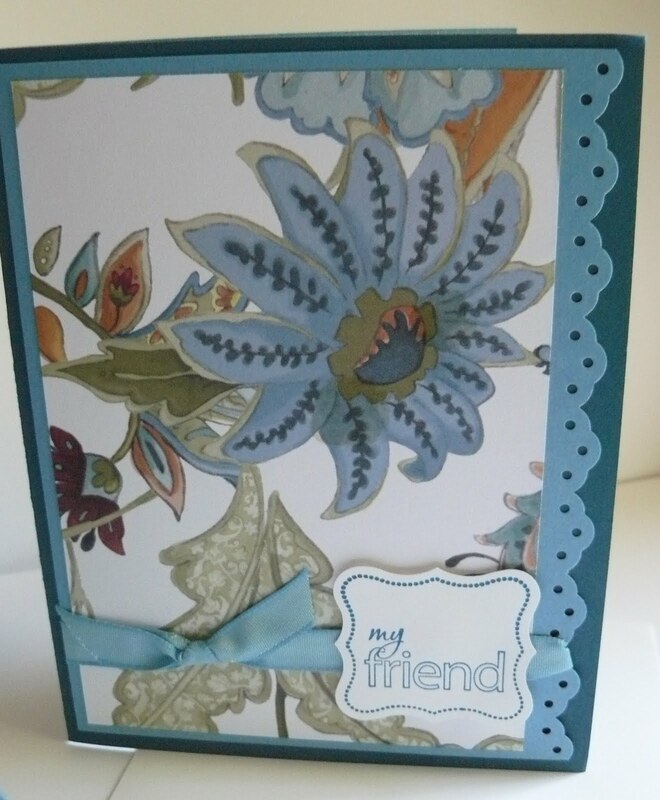 This class features 4 cards with the Fabulous Florets stamp set. If you're around the weekend or weeknights of July 31st/August 1st and August 2nd, feel free to email me to reserve your place in this fun class! The cost of the class is $20 and includes all paper cut and scored, as well as the envelopes of course! You will definitely want to purchase this stamp set and one of every color family designer paper pack when you finish making these fun cards! If you want to purchase the tutorial, you'll need to contact the creator, Chat Wszelaki at Me, My Stamps and I. Hope you can make it! For more information, check out my website for dates, times and location HERE. 2 of the cards are a bit self-explanatory. 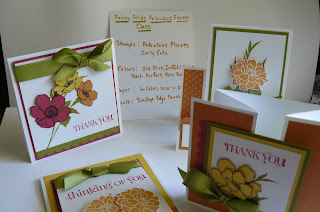 The card on the left is so bright and cheerful with it's summer colors! 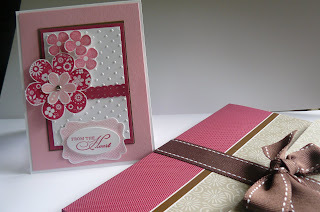 She punched out the flowers using the new Triple Blossom Punch, adhered it to the squares and mats, and then embossed the whole thing with her Big Shot and the Square Lattice Folder. The red mat underneath was embossed with the Perfect Polka Dots folder. So fun! The last card is also very beautiful, but I took a couple of extra photos of this one so you can truly appreciate it's beauty and how it's made! 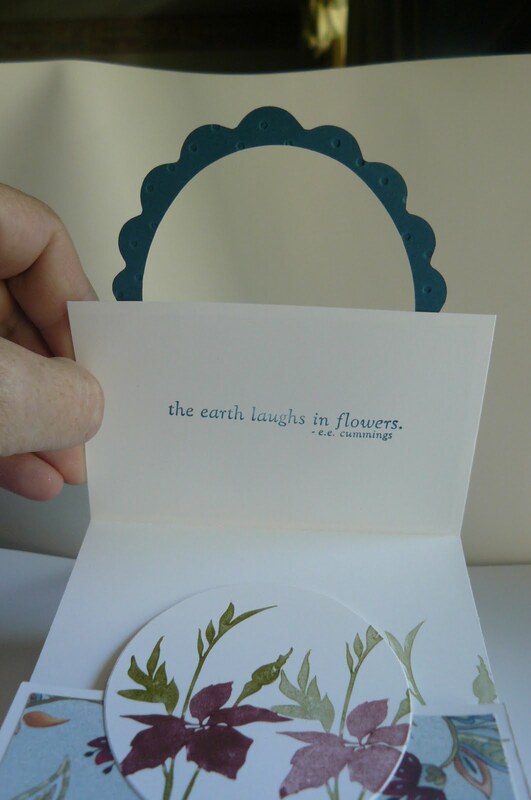 This demonstrator used the Scallop Oval Frame die to make her main image, but adhered it to the top/middle of the card so that it opens very uniquely! Love it! Just a quick post while I'm gone for a week or two on my summer vacation! I got these Big Shot swaps in the mail on Friday! I was part of a swap that was sponsored by U Stamp with Dawn and Friends. I was a guest designer in their group last Christmas. Now, I'm happy to participate in their swaps! I never use the Bold Butterflies die but I love it for these two cards! 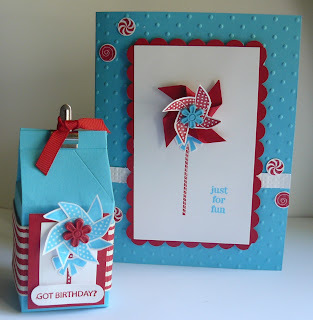 The smaller card in the forefront used this die, sandwiching a small note card between. 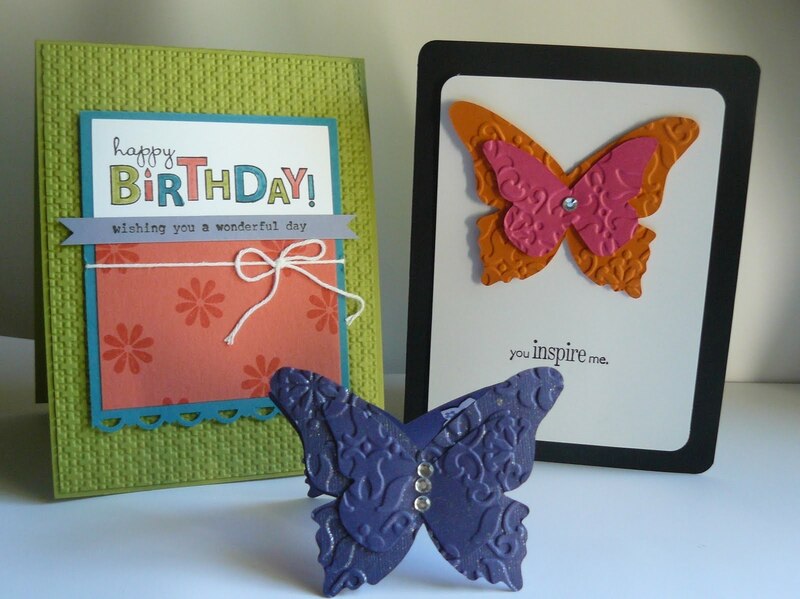 Then, she used the Beautiful Wings embosslit to make the smallest butterfly on the front. Adorable! 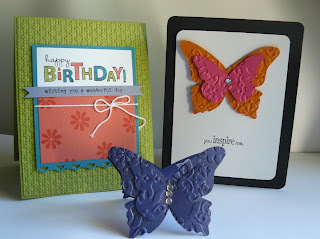 The back butterfly card is gorgeous in it's simplicity! Black is elegant as it is, but with a clean image, there's sometimes nothing more elegant! 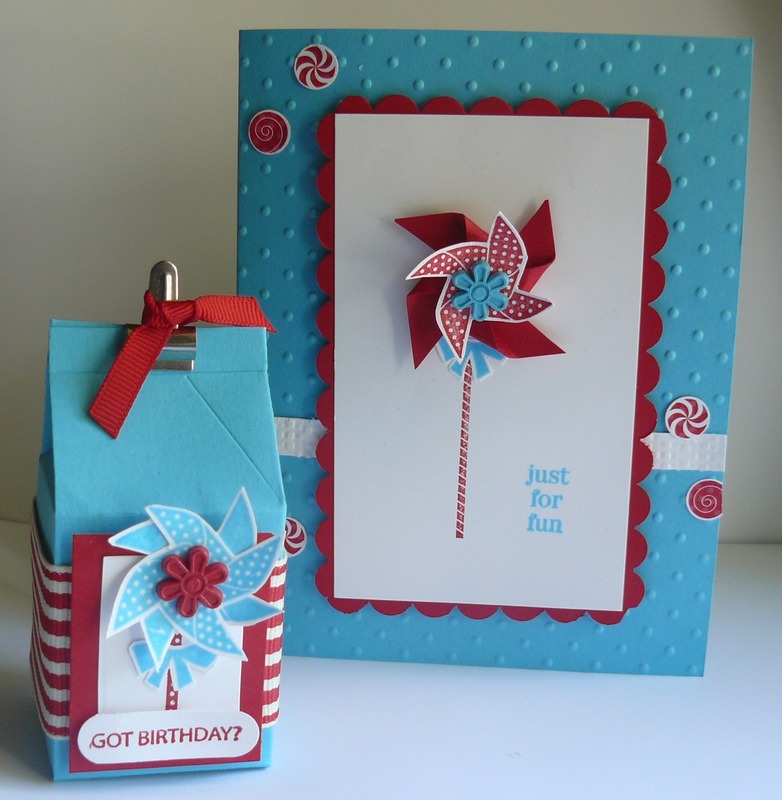 Don't you love the bright birthday card?! 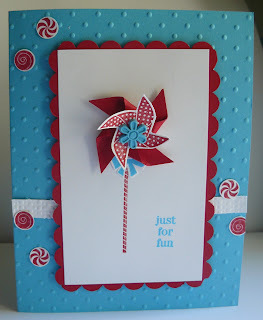 It's so fun and summery ... and it uses almost all of our new incolors for 2011-2012! The card itself is Lucky Limeade, with an embossed Lucky Limeade layer on top. Then there's the Calypso Coral that's matted with Island Indigo. The sentiment letters are all colored in with the new markers. 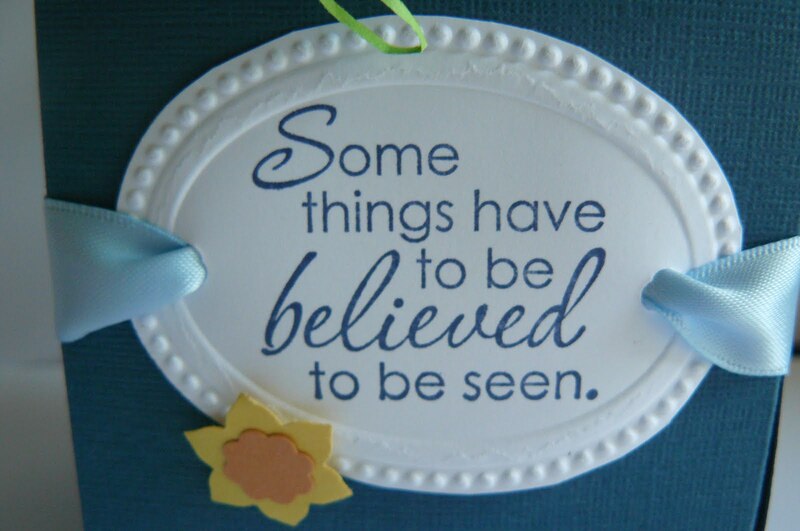 I figured out that the sentiment comes from the Bring On the Cake stamp set. Luckily for me, I just got this in the mail this week! 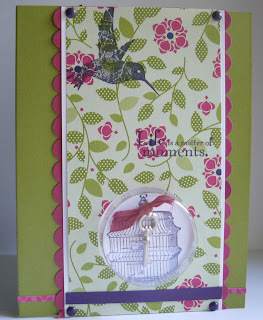 It was one of the stamp sets that I chose as my free set based on my sales from Sale-a-bration this past year. I LOVE free stuff!! 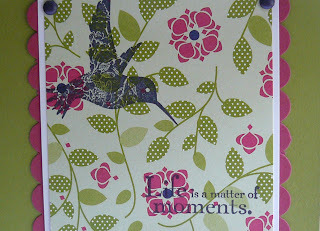 Oh yes, and there's one more smaller sentiment, also from the same stamp set, stamped on the Wisteria Wonder card stock. That's all for me today! 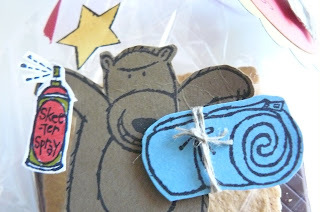 Tomorrow I'll have more swaps to show you! August 10 is National S'mores Day . . . 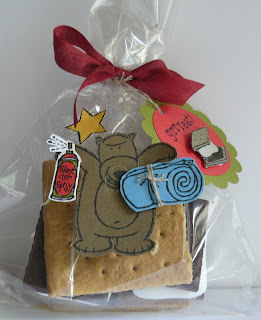 Yes, there really is a day to celebrate S'mores! My cute little package uses the Under the Stars stamp set for the main image. I bought this set a few years back, thinking I was going to make a bunch of these packages! Isn't the bear adorable? I stamped him on Soft Suede with my Black Staz-On (this is my "go-to" stamp pad all the time! ), then cut him out. The sleeping bag was stamped on Marina Mist, with a little snippet of linen thread holding it "closed". Of course, everyone knows that you need "Skeeter Spray" if you're going camping (or even if you're staying home in July/August -- they're brutal this year!)! I made a "to/from"tag too. Now I can't remember if it's Poppy Parade (which it looks like) or Real Red. I kind of think that the picture doesn't do the color justice, and that it was Real Red. The scallop circle is Old Olive of course. One more thing about my s'more: I found these already-squished marshmallows to put in between my graham crackers -- so cute! Why didn't I think of that?! The chocolate is actually bits and pieces of a dark chocolate Lindt bar -- can you believe I don't have any "normal" chocolate in the house? Well, I'm going to make a few more of these to take to my nieces and nephews this week! I'm "on holiday" after my night shift tonight as my friends in the UK say! I hope you're staying cool and find time to stamp during these busy summer months! I had a few more minutes to play in my "Stampin' House" this week! Yep, that needs some explaining I think! I had my New Catalog Open House on Thursday (the preview for those going on vacation this week! ), on Sunday afternoon, on Monday night, and again on Tuesday morning. On Tuesday night I did an open stamping session where 5 delightful ladies caught up on some past stamping projects/kits that I had for sale! 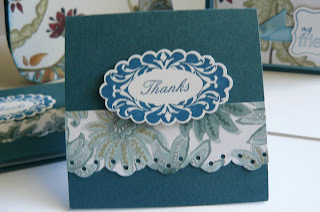 Wednesday morning was one more open stamping session (I have a lovely card to share from that too!) with my good friend Carol, which is when I got inspired to case page 65. The reason I called it my "Stampin' House" is because I tended to overrun the place with stamped samples, catalogs, ideas, etc.! At least that's what my husband was thinking by Wednesday night! Luckily, I got some company yesterday -- my father-in-law is visiting from NY just for the day on his way to a meeting -- he stays in my actual "Stampin' Room, requiring a head-to-toe cleanup of the place! It's a good time for a tour, as I can find everything right now! Here's my samples for the case. You'll possibly/probably recognize it -- it's the milk carton and card on the page with Got Treats and Sweets for the Sweet. What did I do differently?! I changed the image on the card, although I used the same stamp set. I love pinwheels ... always have! This was on my first order that I got from the new catalog! I also didn't use ribbon, but instead decided to use a strip of Whisper White cardstock that I embossed with the square lattice folder! Effective I think! Do you need some details? The card is Tempting Turquoise, embossed in the Big Shot with my fun Perfect PolkaDots folder. I image is on white, matted with 4 separate strips of punched scallops (not perfect by any means!) with my Scallop Edge punch. The pinwheel was stamped and cut out (one of the designs), then attached to a larger pinwheel of solid Real Red cardstock. I'm pretty sure that it was 1 1/4" square, cut in on the diagonal almost to the middle, then placed beneath the stamped pinwheel, with a turquoise flower brad from the Brights Flowers collection. The tiny little circles were actually punched out with my Bitty Punch from one of the designs of the paper in the Big Top DSP pack. Love, love, love that fun paper!! This is pretty self-explanatory I think. The most time-consuming of all was figuring out how big to make my main image to fit on the side of these adorably teeny milk cartons! I can't even tell you the final measurements, but it's 1/4" less than my Real Red mat which is about 1/4" less than one of the sides of the carton. So, for the difference? I used a different color for the carton. 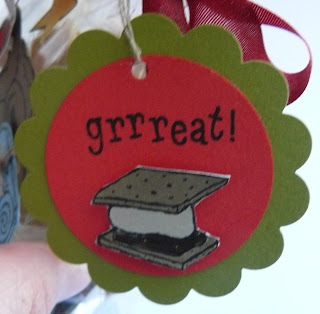 I also accented my carton with ribbon, used a different color for the ribbon (the Real Red 1 1/4" wide striped grosgrain instead of an orange stripe), a different image (I used the pinwheel from Sweets for the Sweet), but the same sentiment from Got Treats. My clip at the top is the same, with a scrap of Real Red 1/4" grosgrain instead. 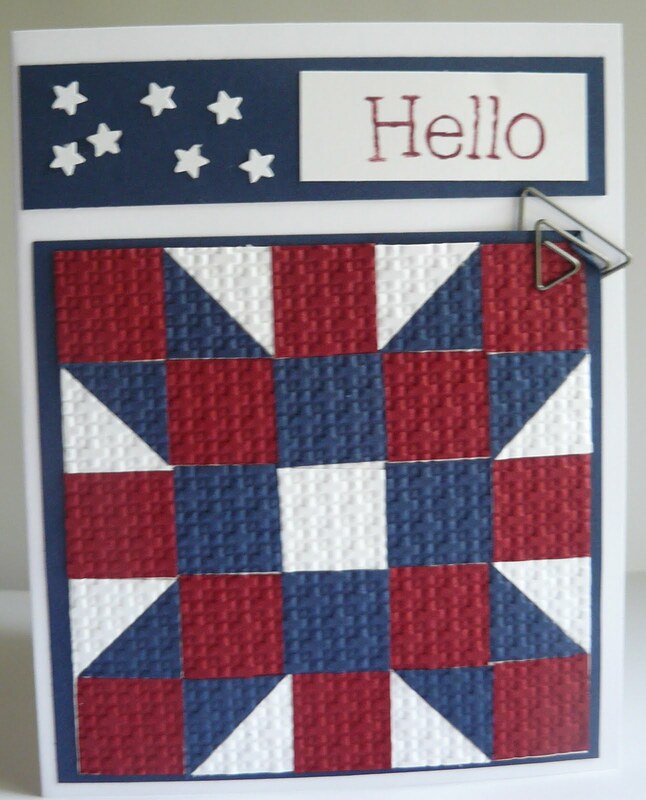 Now, for my last sample, I'm showing you the card that my good friend, Carol, made after my quilting class a few weeks back (see my post here). In the class, we made 2 cards, but I also made up a bunch of templates for other patterns they could do on their own. These patterns also had a sample of cards on the web that I had found and loved! Basically, our pattern was 5x5 (as it is here), but I showed 4x4 samples, different layouts of the 5x5 or 4x5 squares, etc. Look at what she made with it! The mini stars are not Stampin' Up, but I believe everything else is, including the lovely paper (Cherry Cobbler and Night of Navy) -- wow!! 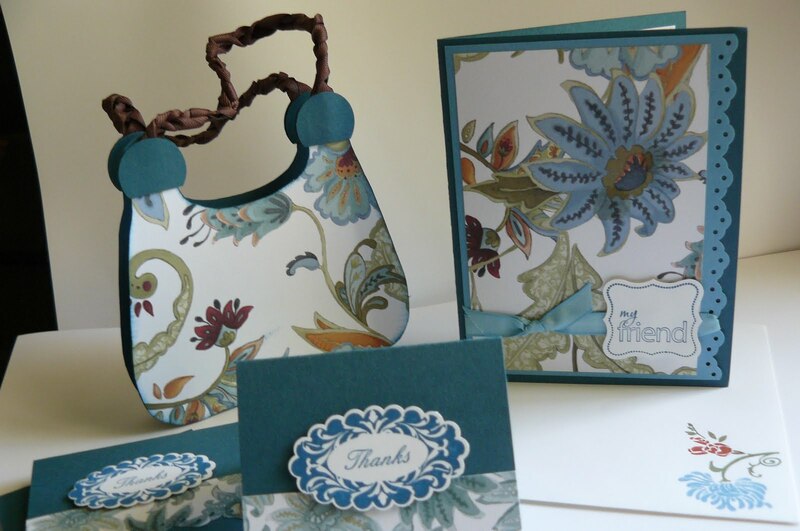 I still have a few of my card kits left for this class if anyone is inclined to make it (cost of the kit to make the 2 cards is $10 and does not include that fabric flower or the cost to ship to you-- it does include all paper needed, scored and cut, plus the envelopes. You will have to cut your own squares -- I only send you the DSP strips). For $2.95, I'll send you the templates that I gave the ladies in my class so you can make your own! Email me if you're interested and I'll send you a Paypal invoice! Good morning all! Another sunny day here in northeastern Massachusetts, but whew...the humidity is high! I'm getting ready for the last installment of my New Catalog Open House! It's been wonderful to visit with old and new friends and to browse the catalog with everyone! I'm telling you -- it's good for me too! Each person sees something in the catalog through their own eyes but chances are good that I didn't view it that particular way, or even notice a new stamp set! I'm having a blast! Back to business though! I made a quick card this morning that cased page 183 in the catalog. The original card is showcasing a vintage-looking card with the Mocha Morning specialty paper (that was on my first order, and believe me, it's as beautiful IRL as it is in the catty if you love the browns and blacks!). I decided to make mine less vintage and more colorful. My card uses the Cheerful Treat DSP that is a hostess special. I love this paper! The colors are so fun! The base of the card is the new Lucky Limeade card stock. I did a scalloped mat of Rose Red, with a strip of white card stock underneath where I stamped the bird cage (just like the original card) in Concord Crush (as opposed to the original card which was on vanilla in brown). 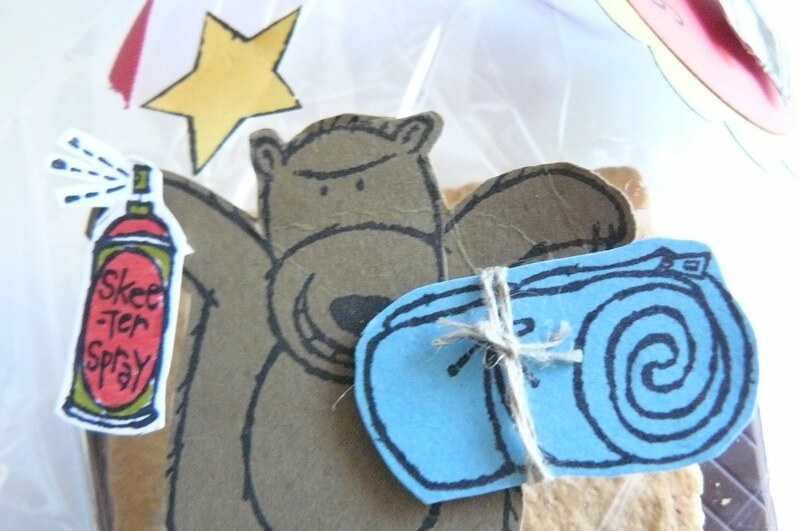 The paper on top is a 2 3/4" strip of the Cheerful Treat DSP. The purple strip is Elegant Eggplant since the Concord Crush seemed a bit too bright (although that is the color in the DSP). 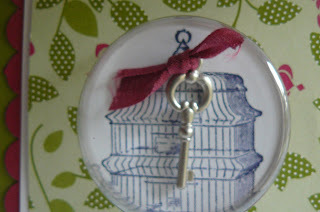 I tied a trinket key knotted in Rose Red seam binding to the handle of the birdcage that is showcased behind the Sweet Treat Cup. So, I guess I kept the basic layout but changed the paper, colors and stamp set for my case for Gretchen Barron's Inspiration in Action Catalog Case contest. You can find her post here. Stamps: Elegant Style and Nature Walk. 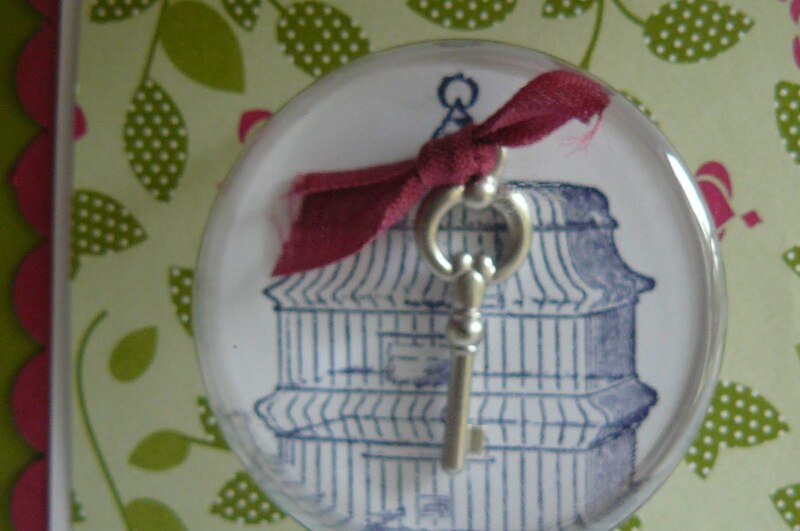 Accessories: Trinket Key, Rose Red seam binding, 1 3/4" Round Punch, Scallop Edge Punch, Sweet Treat Cup. Some Open House Samples and another Catty Case! 1. The Totally Tess Fancy Favor Box filled with some of my favorite new and not so new "essential" products! This is cased right out of the Catalog and Idea Book on Page 73! I just changed the color of the box, clipped on the new mini clothespins, and filled the box with a few of my favorite items (Paper Snips, a clear block, the Flower Fusion Sizzlet, the new In Color Markers, a punch, and some Stampin' Mist). I'm submitting this as another sample for Gretchen Barron's Inspiration in Action Catalog Case Contest found at this post here. 2. 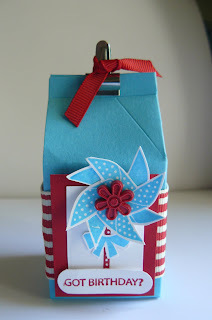 Another Fancy Favor Box! 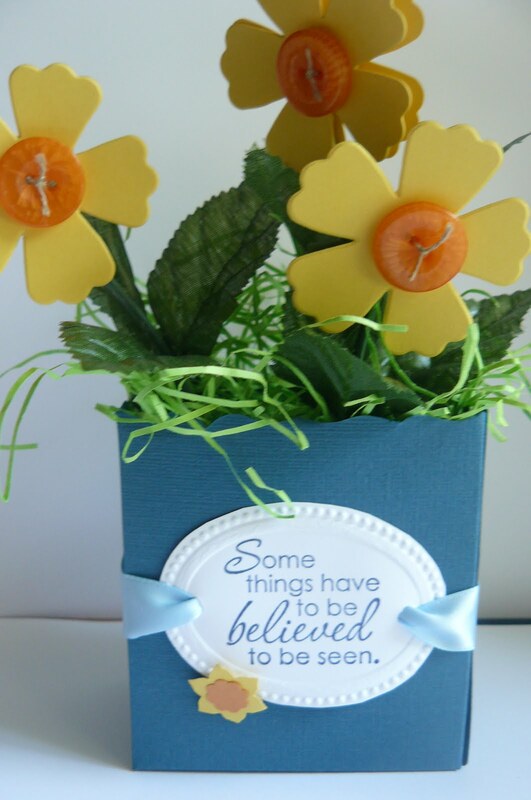 I used some Not Quite Navy 12x12 paper to cut out this box, and I cut some flowers using the Fun Flowers die to cut out some Daffodil Delight flowers. The centers are the large buttons from the Brights Buttons collection. 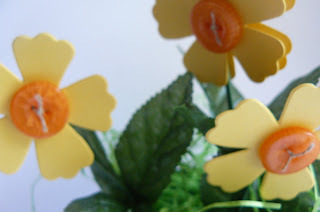 I tied some linen thread through the centers to attach them to the flowers. Cute, huh?! 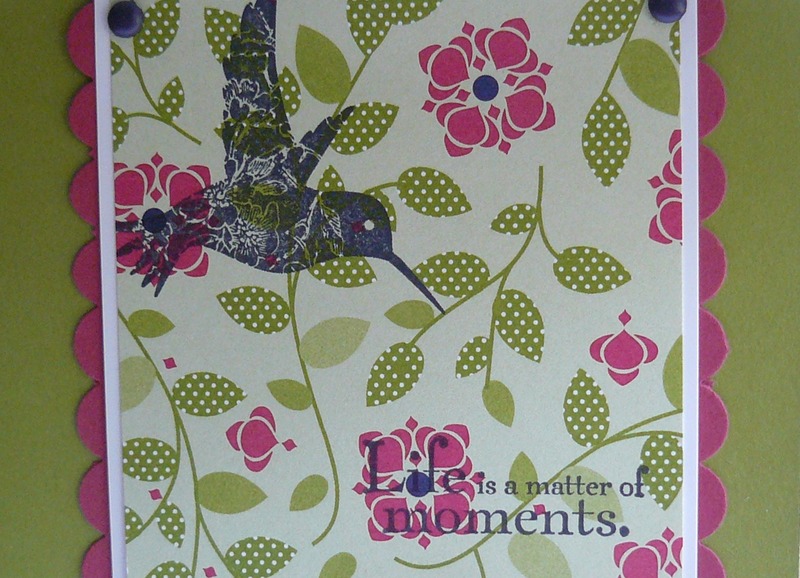 The sentiment is framed using the new Designer Frames Embossing Folder. I love it! The mini flower is punched with the Boho Blossom punch, and the ribbon is the "new" Bashful Blue Satin Ribbon (new to the big catalog, but carried over from the spring Mini Catalog! Love it!). 3. This is a "recycled" frappucino bottle that I covered with a strip of the Just Add Cake DSP. 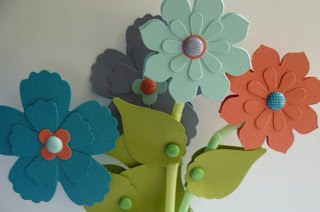 The flowers are cut from various sizes of the Fun Flowers and the Blossom Party dies. 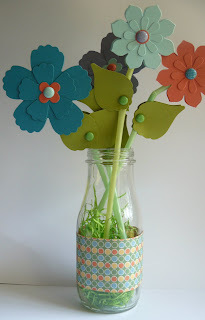 I used these flowers to showcase the new In Colors: 4 colored flowers, plus the leaves are cut from the Lucky Limeade paper to make number 5! I wouldn't say cute ... but definitely effective! Oops, forgot to mention that the brads are the new In Color brads! Don't you love them?!! Good morning everyone! I named this post "Part 1" because I've discovered that there are hundreds of good ideas in the new 2011-2012 Stampin' Up Idea Book and Catalog! In the past, I've browsed and browsed, but this year, I'm really trying to show that the catalog is more than just products! Who needs to go to the store for the latest issue of Cards (although this may not stop me!) with the catalog sitting right next to us?! (If you don't have one yet, then you'd better email me soon! You don't know what you're missing!) I'm actually entering this into Gretchen Barron's Inspiration in Action Catalog Case Contest that's currently going on! Check out her blog here to see a bunch of other samples that people have submitted that feature cards etc. that they case'd in the new catalog! It's a treasure-trove of new ideas! So, that being said, my samples today come from page 59 and feature the stamp set, It's a Wrap. 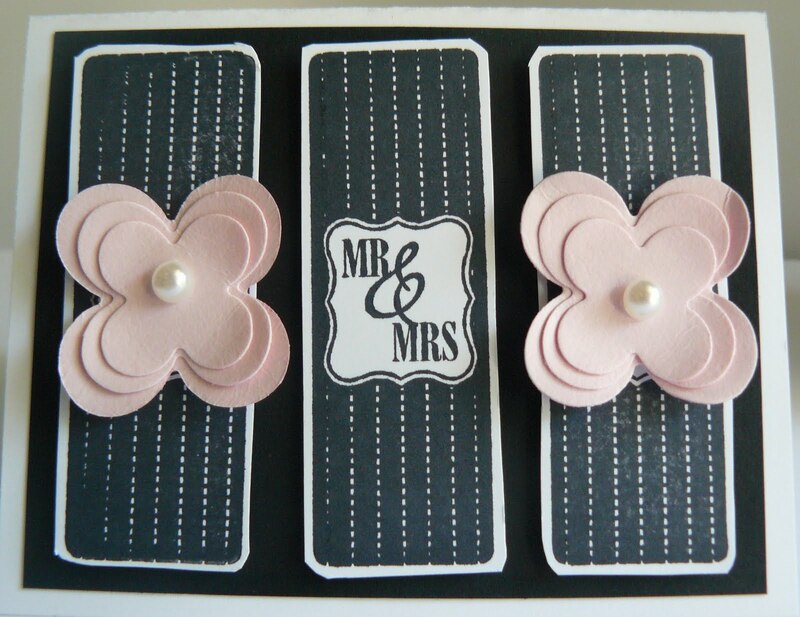 In the catalog, the card shown is made using Pear Pizzazz (or Certainly Celery) and Blushing Bride flower fusion flowers. 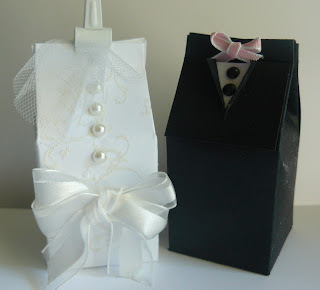 I chose a black and white theme as it seemed so elegant for a wedding (I'd probably personalize the card to the bride's colors if I could tell from the invitations) and matched the little bride and groom milk cartons that I made this weekend to show off the milk carton die and my Big Shot at my Open House. 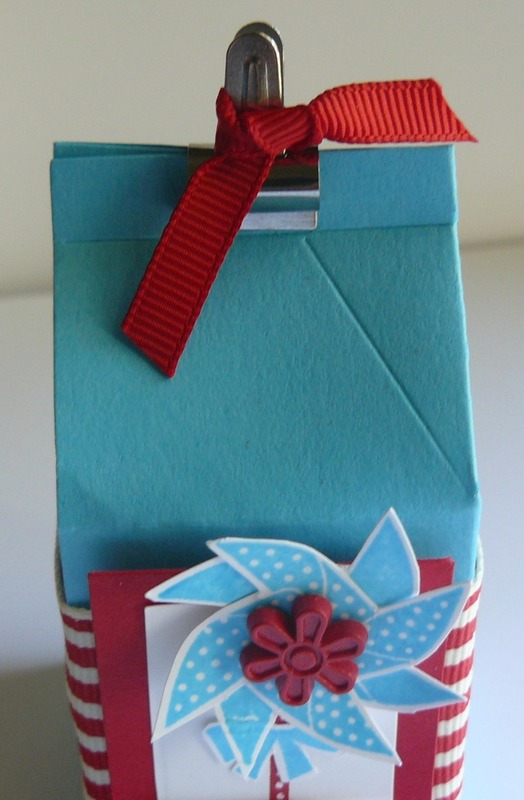 I made little "Thanks for Coming to my Open House" favor boxes, again using the idea from page 59. 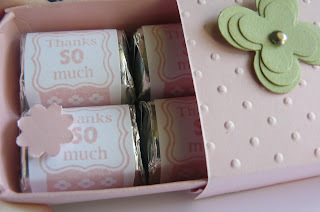 Inside the box is where I used the "Thanks SO Much" stamp -- a little boho blossom adhered to one of my nuggets is adorable (IMO!). The covers to each of the boxes are embossed using a different embossing folder -- I embossed a strip of paper as well, then laid it over the Matchbox Cover of the die (the only thing not embossed that way was the thicker "strip" that is adhered on the side. If you have the die, you'll see what I mean. If you don't have the die, then go to my store! It's great for a little thank you to a hostess, party favor, teacher gift, etc.! Lastly, let me share my milk cartons with you! 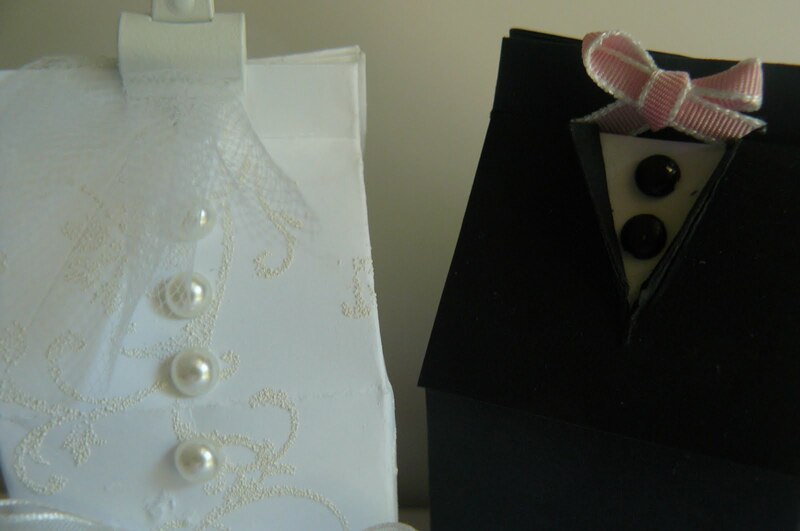 It's a little difficult to make the white carton look like a bride, but I did my best! I used the "Elegant Style" swirl to emboss on the box with white embossing powder (just randomly stamped in VersaMark ink first). I did a double bow with the white organza ribbon on the front (since you won't see the back! ), some pearls down the front (I wish now that I had thought about a string of pearls around the neck! ), and a white clip holding a snippet of white tulle that I had laying around since I cleaned out my craft closet this week! The groom's box was a bit easier: I just cut an underlying piece of white cardstock for the front of the box, then overlayed a piece of black cardstock that I cut half-way down and folded back for the jacket lapels. This part was easy because I remembered how I did my shirt card a few posts back seen here. I decided that the pink 1/8" taffeta ribbon would be a nice touch as it matches the favor box that I made. All in all, I think the whole set coordinates nicely and I had a great time (all day Saturday!!) creating! Happy 4th! A Big Shot "Sampling"! Happy 4th! I needed a birthday card for a friend of ours today -- can you imagine that there are fireworks to celebrate "your" birth every year?! Pretty cool! Anyway, this boy (almost man now!) 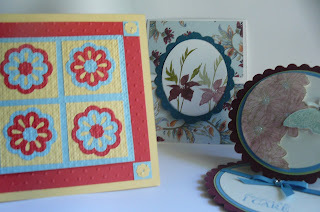 appreciates my cards but I only had a minute to create, so I made a Big Shot "Sampler" card! It took minutes (except for the 1 hour planning it! LOL!). Can you count how many folders I used?! 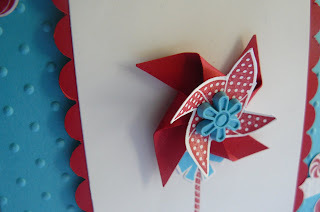 Just a hint ... the little stars used a different folder than any other part of the card! 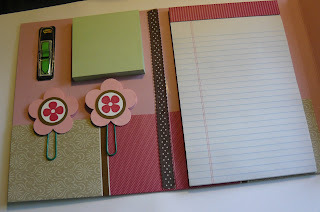 Supplies: Adhesive (sticky strip, since I don't feel like the snail adequately sticks to texture), Big Shot, Embossing Folders (no fair peeking till you've guessed the different folders! LOL! ): Pretty Petals, Square Lattice, Polka Dot, Finial Press, Vintage Wallpaper. A File Folder Notebook Folder! I've been busy again this week! I needed to make a 3D swap for my new friend, Jamie, in Japan! I've never mailed anything to Japan, so this was a brand new experience! 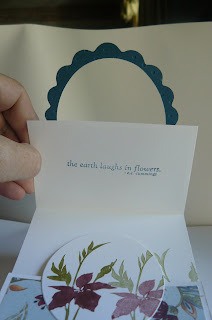 I decided to use the Thoroughly Modern File Folders that Stampin' Up! sold a year or two ago to fashion my folder. The ribbon running down the middle is to hide a flub! 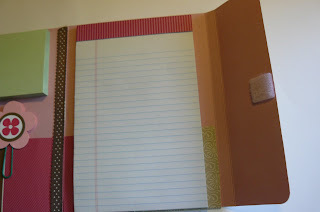 I cut a slit, intending to slide ribbon through, but instead, decided to slip a ribbon knot over the notebook holder. If you don't recognize it, that's because it's new! Our brand new 2012 polka dot ribbon! 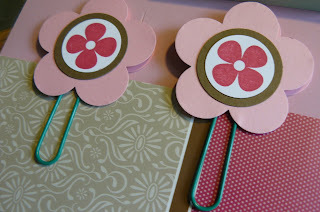 The book marks are made with another flower from the Printed Petals stamp set. 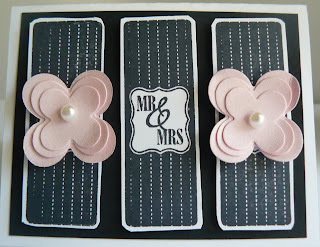 I stamped them in Rose Red and used my 1 1/4" circle punch to punch them out. 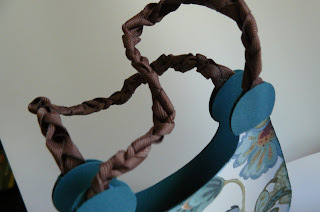 I then punched out a soft suede 1 3/8" circle, and layered it on top of the Flower Punch. I used a couple of layers of dimensionals to pop them up on the paper clip. Voila! You have a bookmark that took minutes to create! 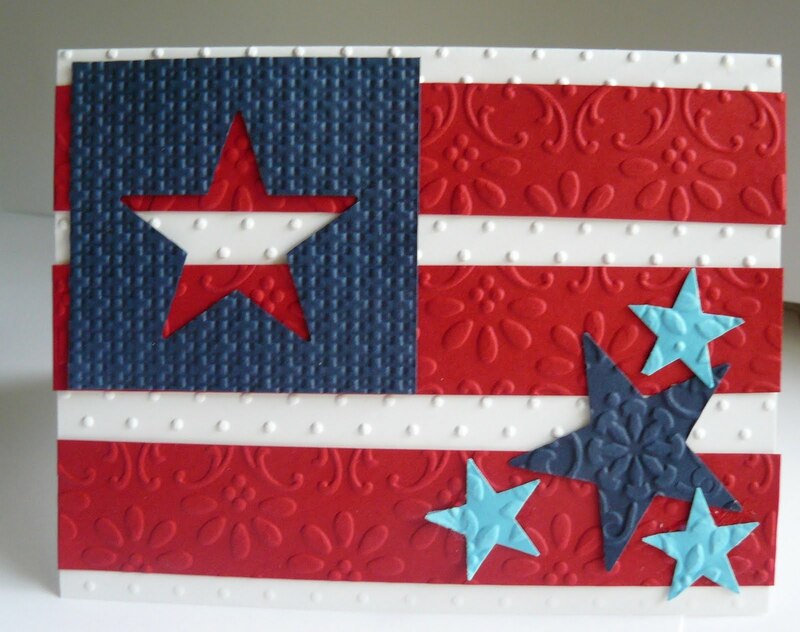 If you're looking to make this yourself, go to Splitcoast Stampers to the Resource Section and look for File Folder Notebook Holders. It didn't take that long once I decided how to decorate it! 2011-2012 New Catalog Open House! Enjoy a fun afternoon or evening (or maybe even a morning!) 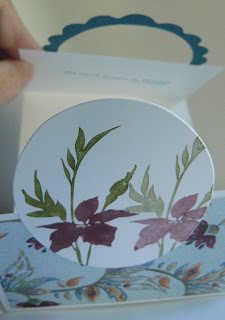 checking out the new 2011-2012 Stampin’ Up! Idea Book and Catalog! It’s a brand new year and there are so many new additions! · Check out the 5 new In-Colors! · New ribbon colors and styles! · New punches and dies for the Big Shot! 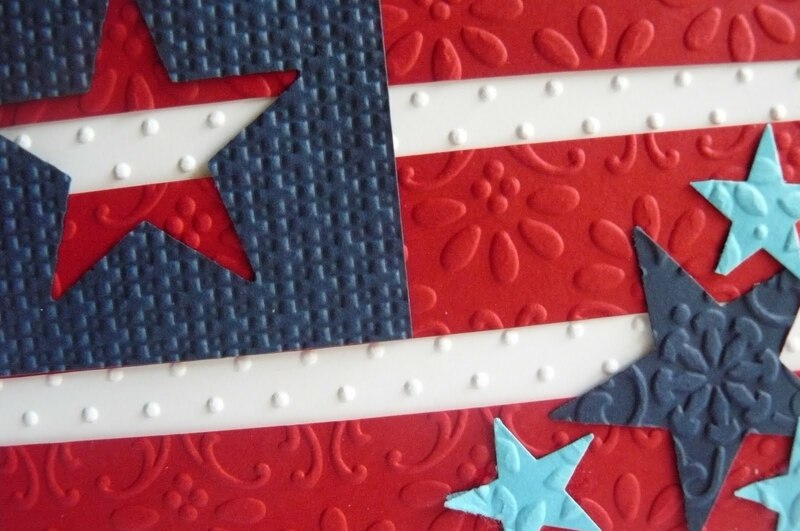 · New class ideas plus a stamp club offer you won’t want to refuse! Sunday, July 10, 2011, 2-4:30 p.m.
Monday, July 11, 2011, 7-9:30 p.m.
Tuesday, July 12, 22011, 9– 11:30 a.m.
Free Make and Take, Retiring Stamps and papers for sale at a discount, and a brownie sundae buffet! Did You See the New Catalog? !